Protein bites are an excellent and delicious way to start your day and are also very handy to have around when a little needed pick-me-up snack is required at any point during the day. I always try to ensure some bite-size protein snacks are on hand. I've made dozens of different such snacks over the years, and I will always be making new ones. They have become an essential homemade staple. And on the lookout for new ideas, what better way to really ensure that you are getting a boost of protein in your snacks than to add lentils, which is the especially unique element of these attractive little energy bites. Earthy lentils not only add protein, but they're combined with oats, sunflower seeds, hemp seeds and almond butter — all plentiful sources of protein themselves — to make a bite that's truly loaded with proteins, textures and tastes. 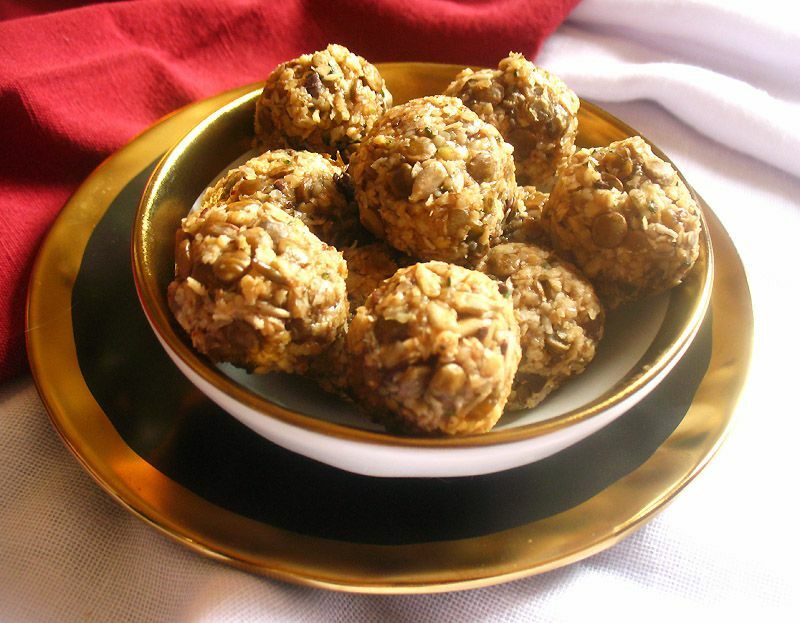 Dried shredded coconut, dark chocolate and a little maple syrup add even more flavor to these amazing energy bites. Each bite is a medley of flavors and textures — earthy, nutty, chocolatey and sweet but not overly so — and delightfully soft, chewy and crunchy. Eating just one will hardly do because they are so delicious, but they're very filling too. And like so many vegan protein snacks, they're really easy to make with only measuring tools, a bowl, a mixing spoon and your hands — no need for the food processor for this recipe. This recipe comes from The High-Protein Vegan Cookbook: 125+ Hearty Plant-Based Recipes , a new plant-based cookbook from Ginny Kay McMeans — author, photographer and blogger behind Vegan in the Freezer — that features recipes high in protein. Shortly before Christmas I received a copy for possible review on my blog, and I didn't realize that I was hungry at the time until I opened the book and started rifling through the pages. As a vegetarian, and I assume even more so for vegans who follow a strictly plant-based diet, likely the most frequently asked question after "just what DO you eat?" is "just where DO you get your protein from?" — as if vegetarians and vegans only ate leafy green salads and vegetables. In fact, I've long known that many plant foods are an excellent source of protein, including nuts, seeds, legumes and quinoa. But I admit that it wasn't a lesson I knew very well when I first became a vegetarian, and it is an essential important lesson to learn even more so for people who are starting out on a vegan diet. 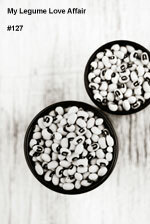 The trick for vegans or even for those who just want to incorporate more plant-based meals into their diet is to use a variety of these plant proteins throughout the day to make sure that you are getting all of the nine essential amino acids that don't always appear in every plant protein by itself. Nut butters, for example, are always a quick and easy high protein go-to for me during the day, in addition to the legume and grain based dinners I make. 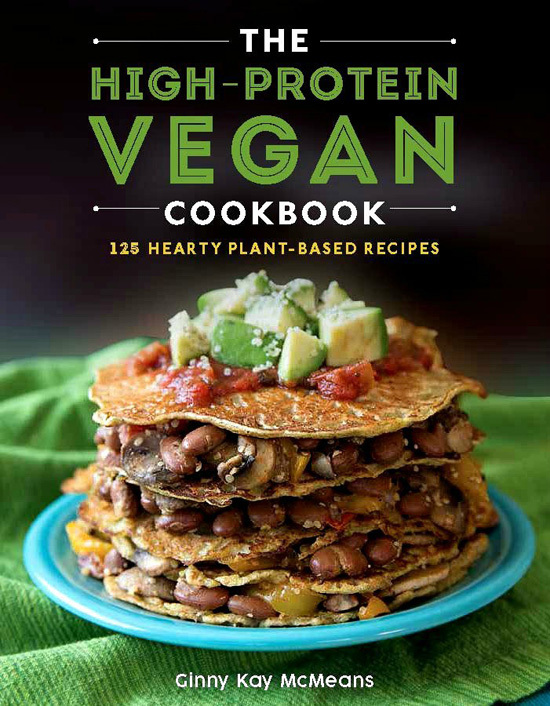 And it doesn't hurt to combine these plant proteins with fruits, vegetables and seasonings into delicious and interesting creations, which is exactly what Ginny Kay McMeans does in The High-Protein Vegan Cookbook: 125+ Hearty Plant-Based Recipes . This new cookbook is divided into six chapters for eating tantalizing and high protein plant-based foods throughout the day. "Power-Up Appetizers" will get your party going and your appetites dancing with recipes such as Lentil Balls in Sweet and Spicy Red Sauce, Tempeh Stuffed Cremini Mushrooms and Chickpea Salad Crostini. "Breakfast Power" will have you starting your day with energizing Buckwheat Coconut Porridge, Savory Quinoa Breakfast Cups or perhaps Lemon Strawberry Protein Muffins. One mustn't forget "Lunch Bowls, Chilies and Sandwiches" and your mid-day meal would be especially enjoyable with some Portobello Mushroom Gyros, perhaps a Chopped Chickpea Salad Veggie Bowl or a Touch of the Tropic Rice Bowl. "Portable Snacks" like these amazing lentil energy bites, Tropical Lemon Protein Bites and Chocolate Cake Munch Cookies will keep you energized anytime you feel like a boost, and "Protein-Packed Dinners" will complete your busy day with ideas like Chickpea Tortilla Fajita Stacks, Three-Layer Tacos with Kale Salad and Superpower Stuffed Poblano Peppers. There's also a chapter on making your own seitan and using it to make Steamed Seitan Smoky Nuggets, or if you please, Steamed Seitan Chipotle Links — the recipes in this chapter can be used in some of the other recipes in the book. I'm looking forward to trying many of the creative and tempting recipes from this lovely cookbook. A special thanks to Ginny for arranging a copy to be sent to me. Add the chocolate chips, oats, sunflower seeds, hempseed, and coconut in a large bowl. Mix in the cooled lentils. Add almond butter and maple syrup. Mix well. Form into thirty-six balls and places in a glass container with a lid. The recipe called for lentils but did not specify what type to use. Based on the instructions, I decided that green lentils would work best because they are quick to cook and I thought that the texture would work well with the energy bites and so they did. For the chocolate, I used a fine dark chocolate from a bar that I cut into pieces as I didn't have any chocolate chips on hand. I used smooth almond butter, but chunky almond butter would also be a fine alternative. Depending how large you make each bite, you may end up with 30 to 32 bites about 1-inch in diameter, as I did, rather than the 36 indicated in the original recipe. The dough came together quite well, so the proportions were just fine as was the flavor, but it was considerably sticky and stuck to my hands and thus a bit messy. 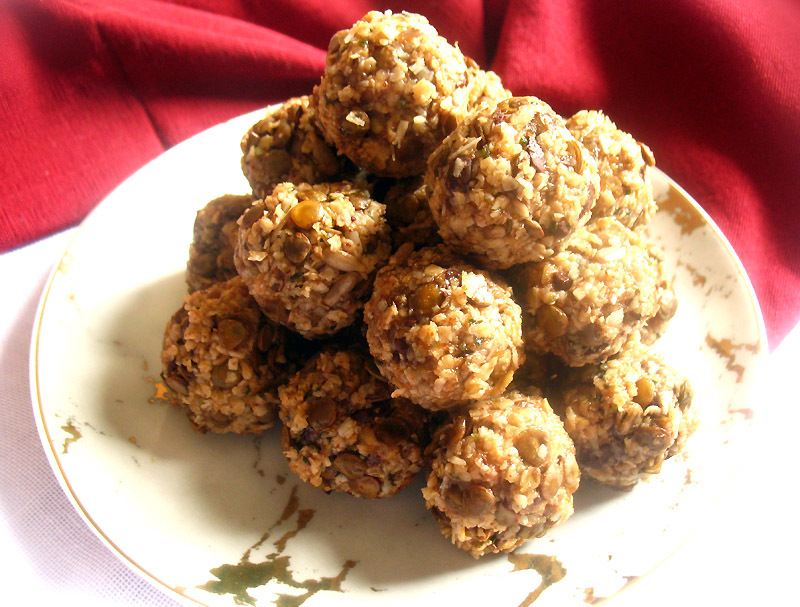 To make the mixture easier to shape into small balls, the next time I make these bites I think I will stir in more hemp seeds, add some cacao powder, maybe some finely chopped dried fruit, such as apricots or cherries, and perhaps add a wee bit more chocolate. I would also use old-fashioned oats rather than quick-cook oats. A tablespoon or two of coconut flour would also be a consideration. 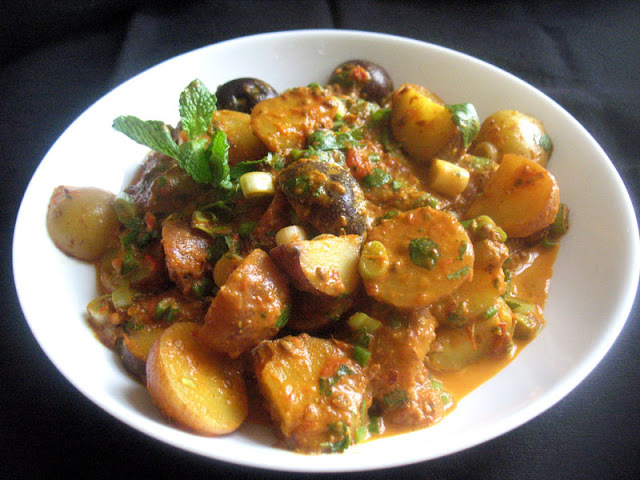 Overall, I loved the recipe and no adjustments are required. My suggestions regarding these delights are simply the reflections of a cook and baker that enjoys fussing around in the kitchen and trying new creations. Thank you so much Lisa! What a beautiful review. I really appreciate your time and information. Now I'm hungry! Sharing! Btw, cool blog and beautiful posts! Hi Niki! Odd, I was just thinking of you the other day. Hope you are well and thank you for reading my site for all of these years!